Inverse decay of light and an alternative to traditional image based lighting and a move to incident light fields. Let me take you back, way back to year 9 in high school in 1985, where I was introduced to light and photography and the inverse squared rule of light decay. In black and white photography, you expose of piece of photosensitive paper to light for a period of time using an enlarger then go an develop that exposure with a chemical reaction in a tray and the darkness develops in front of your eyes. The more light that the paper gets, the darker the colour will be. That is why you use a negative in the enlarger so you mask of the black areas. Here comes the inverse squared law. If you want to make a print of a a4 piece of paper you might have worked out you need to expose for 10 seconds to get the image that you want. But then you want something that is bigger. An a3 print, you need to wind back the enlarger so that the image is projected onto a greater area. The lamp still has the same brightness the negative still masks off the same amount of light. The paper still has the same chemical response. So you expose the a3 sheet for the same 10 seconds. The image comes out very pale. The inverse squared rule of decay. Because the light is further away from the photosensitive paper, not as much light reach per unit area, so to get the same chemical reaction for the same density of blacks, you need to expose for longer. The rule is as follows, if you double the distance between you and a light source, you end up with one quarter the amount of light per unit area. So it follows to get the same exposure you might need to expose the a3 sheet for more like 40 seconds compared to the a4 sheet of photosensitive paper. 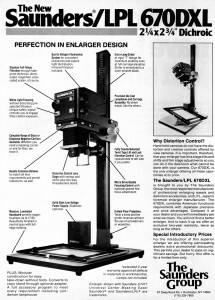 So the inverse square law is real, I have seen it in action when developing prints in 1985. So on a film set you can get an approximation of this by shooting a high dynamic range image, by assembling a number of low dynamic range images at a number of different shutter speeds. But something is usually forgotten with this process. The calibration could be easily overcome by using a light emitter of known energy in an off state and and on state. So to do this you have an LED of a known size at known distance from the camera. You measure the luminance at 1 cm from the light source with a http://en.wikipedia.org/wiki/Radiometer and get a result of light sources luminance in candella per meter squared. Then you create a HDR of this same light source at a fixed distance from the light source, say 1m. If this is a standard LED then you dont need the radiometer every time. If you had access to the radio meter you could just measure the energy of your light sources in candella per meter squared on set. From this you can then derive what a pixel value on the film back of the image taking the HDRI is equivlant to in candella per meter squared. So we have a HDRI and we know the energy levels of the light arriving at the film back of the camera taking the HDRI. If you want to know the energy levels of the light at the surface they are being emitted from, you need to reverse the inverse square decay algorithm. So if you have two light sources in your HDRI with equivalent pixel values, then the luminance of those two light sources is equivalent at the film back of the camera. But what if the distance of those lights sources were 1 m away from camera and 2m away from camera, both occupying the same pixel area in a cubic cross HDRI. It follows that the one 2 m away would be 4 times the intensity as the light that is 1 m away. This is valid for using this as a measure of the light at the surface of the object as an albedo. But if you want to use this as a light source for illuminating synthetic object, with correct attenuation. You need to take into account the inverse squared falloff of the light from its surface to reaching the film back where it is measured and the luminance at the light source. Further more you can put some importance sampling into your light sources. Explains the concept a whole lot better than me. But this came to me at 11pm on a Saturday night, when I was trying to go to sleep, so I thought I would scribble it down on a piece of paper so the insomnia didnt get the better of me. Now it is 3:32 on a Sunday afternoon, the lawn has been mowed and my blog entry is complete for now.